Two doves to be exact. The first, nestled safely in her nest. We have been watching her build and nest her eggs for a few weeks now, but we still haven’t heard any baby birds! And what about the second Dove? Well that one (not a live animal!) was wrapped up safe and sound in a box on our porch. A nice little surprise I had forgotten was on its way to me. It was a bottle of Dove® VisibleCare™ Toning Crème Body Wash with NutriumMoisture™. Several weeks beforehand I signed on to product test for Dove®. I thought “What can it hurt? I like body wash. And if it really works, well then that is a double bonus for me! Plus, I don’t have to buy bodywash for a month.” So out of the box came the big bottle of Dove® VisibleCare™ Toning Crème Body Wash, and into my shower it went. Let me tell you a little something about myself, I am a skeptic. I don’t buy products at the store simply because they say they are going to do this or that for me. I want to KNOW that it really works. Likewise any product that promises to do something for me like help promote skin’s elasticity and strength, and actually improve the look of my skin, had better work, or else I am not going to pass along the message. I don’t believe in falsely advertising anything. Now that that is out of the way, I will continue. Dove® VisibleCare™ Toning Crème Body Wash advertises that it will help promote skin’s elasticity and strength, as well as actually improve the look of your skin. It combines the best of Dove® technology into a luxurious experience for beauty seekers. Sounds good right? So here is the deal, this body wash will give you visibly more beautiful skin in just one week. One week is all it takes. And if you stick with it and use it every day until the bottle is all gone (which should last you several weeks) you will really see a difference. 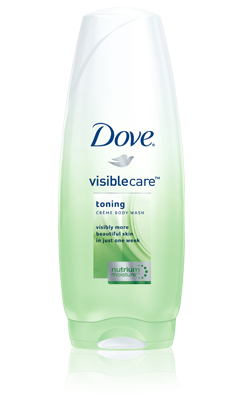 I have used Dove® VisibleCare™ Toning Crème Body Wash every day since June 25th. Today is July 18th, so that means I have been using it for 24 days now. The first thing I noticed about my skin was that it felt properly moisturized. I am going to credit this to the high concentration of NutriumMoisture within the body wash. The second thing I noticed was after about a week. My skin felt significantly softer and looked healthier overall. Toning Crème is the product name, and tone is what it does! I am a someone who has dry skin just about all the time, no matter what time of year it is, so for me this was a welcome improvement! I will be 32 next month, and let me just tell you how much your skin changes in a 5 year period between the end of your twenties and the beginning of your thirties. I hav noticed a general decline in the elasticity of my skin. Things are a little less taught than they used to be. I was really pulling for this Dove® VisibleCare™ Toning Crème Body Wash to help me feel my best, my most beautiful and more confident about showing off my skin. After three weeks of using this body wash, I am sold. It smells wonderful, making the experience of using it that much better. It feels great, lathers like crazy, and a little bit goes a long way, which is nice for the budget conscious like ourselves. But most of all it does what it says it will. It really does improve the look of your skin. I urge you to try it out for a month and see what it can do for you. This revolutionary new product line comes in three different Dove® VisibleCare variants: Toning Crème Body Wash which helps to promote skin’s elasticity and strength, Renewing Body Wash which nourishes and replenishes skin and Softening Body Wash which softens skin and dry spots. Give it a try and let us know what you thought about it!